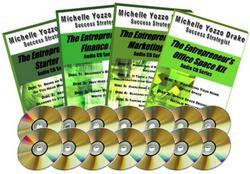 Disc 1: Being an Entrepreneur: Do You Have What It Takes? Have you answered the 11 crucial questions you need to ask yourself before attempting to start a business? This CD explores those thought-provoking queries and offers an inside look at being an entrepreneur: "Confessions of a First-Year Entrepreneur" with Courtney Bedard. Is your idea for a business a good one? Will it be lucrative? How much are you willing to sacrifice to make the dream a reality? Uncover your true motivations for taking the leap and follow Michelle's tips for creating a Mission, Vision and Values for your start-up. Avoid common business naming blunders - too cutesy, too generic, too offensive, too...everything - by listening to Michelle's dos and don'ts for naming your business, including the "12 Commandments of Naming" by Hal Meyer. A rose by any other name may smell as sweet, but a business with the wrong name won't be as successful. Most of us wouldn't get married after a first date, so why rush into partnering with someone when launching a new business? Michelle shares the pros and cons of partnerships, and as a partner herself, offers her insights into everything you need to know before making this critical decision. Spreadsheets, Income Statements, ROI, Risk Assessment...if this sounds like a bunch of mumbo-jumbo to you, then it's time to listen up to this CD. Don't think QuickBooks is going to do all the work for you! Michelle guides you through the basics of business finance in laymen's terms so even those who need a calculator to figure out 10% will be able to create a financial jumping off point for their business. Disc 2: Why Hire a Bookkeeper? Unless your dream business is one based in finance, chances are your talents lie outside of spreadsheets and profit margin calculations. Stop stressing about figuring out how to figure out the bottom line and hire a professional bookkeeper to turn your box of receipts into a financial picture of your business! Lise Milinovich discusses the pros and cons of hiring a bookkeeper and why that decision could be the key to your business's success or failure. Disc 3: Smart Business Owners Write It Down! Whether your procedures, contracts, handbooks, etc. are electronic or on old-fashioned paper, it is VITAL that they are "written" down! Don't wait for your first lawsuit to force you into transcribing operating procedures, employee provisions, and customer and vendor contracts. Michelle explains the necessity for "putting it in writing." Creator of the Book Yourself Solid program and author of "Book Yourself Solid"
You know you have an incredible business - but how do you let other people know, too? MARKETING. Blast your business name and concept out into the world and drive customers straight to your front door with the help of marketing guru Michael Port, including his #1 marketing strategy for business owners. Meet two of the hottest and most respected marketing mavens around: Michael Port and Andrea J. Lee. They reveal their top tips for marketing guaranteed to turn potential clients into life-long customers. Mr. Port discloses the secrets of his Book Yourself Solid program and book, and Ms. Lee offers up a tasty marketing tidbit with her "pink spoon" approach. The "Queen of Cold Calling" and author of "Cold Calling for Women"
Does the thought of picking of the phone and making a cold call send shivers down your spine? Wendy Weiss has the answers on how to overcome that fear, pick up that phone and cold call your way to new clients and success. Ms. Weiss uncovers her tips for "terminating telephone terror" and advice on writing a "cold calling script" that won't leave potential clients...well, cold! Blogging Guru and author of "Blog Wild! A Guide for Small Business Blogging"
"Blog" - it sounds like The Blob's rustic cousin, but it's actually a fast-rising marketing tool that, in today's age of instant gratification, gets information about your business traveling at lightening speed. Andy Wibbels, the "blogging evangelist," uncovers the secrets behind creating a blog for your business and getting that blog noticed by all the right people. In this the electronic age, if you don't have a website for your business, your business doesn't exist. Developing a strong online presence through the creation of a professional website and a solid online marketing program is vital to success. Lori O'Brien, Vice President of Web Solutions, discusses the whys and hows of website development. Co-Author of "Put Your House on a Diet"
Working from home seems like a dream come true...until your "work space" starts serving double time as a laundry folding station, food prep area, and all-around clutter catcher. Ed Morrow offers his best tips on staying organized, de-cluttering and maximizing limited home office space. Bring a little Feng Shui into your home office! A key to your productivity when working from home is the design of your workspace. Learn to create a tranquil work environment from famed Long Island interior designer Natalie Weinstein. She'll explain a few of her favorite tricks for turning a cramped, stressful home office into an place where ideas and productivity flourish. As a special bonus, Ms. Weinstein also discusses her top marketing tip for entrepreneurs! All the tools you need to start and grow your own successful business! OUR PRICE TO YOU: Only $99.99!! !